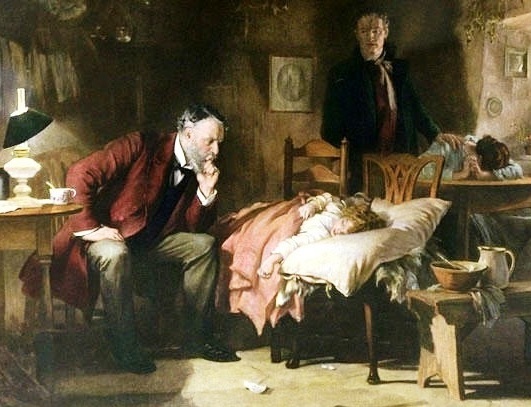 The Doctor, oil painting by Luke Fildes. You’re going to have to take your clothes off for your doctor. Hello! Choose someone you really like, okay? I’m really good at choosing doctors. I’ve managed, no matter where I have lived, to find a terrific primary care giver, and when I’ve needed a specialist (oh, about sixteen bazillion times in my life), I’ve found a great one. After I saw my doctor again yesterday, I realized how incredibly vital it is for me, for the quality of my whole life, to have a great (and not merely okay) relationship with my health care provider. I enjoy seeing my doctor. My doctor knows me and cares about me. She guides me through whatever health issues come up in my life. She listens to me. She gives me good advice. Please don’t settle for a mediocre doctor. It’s stressful, and you need to eliminate as much stress as possible. Stress kills. So, maybe you’ll want to follow my posts for the next few weeks–the ones whose titles will all begin with “choosing a doctor. I have TONS of experience as a patient of zillions of doctors, and I’ve always managed to find a good one. You can, you know, fire your doctors and you should, if you don’t like them. Don’t forget that it’s your health. I choose doctors that I could be friends with. But I’m not; I want the relationship to remain strictly professional. But had we met somewhere other than in an examining room, we would be friends, I’m sure. I admire her, respect her, want to hug her. I think she’s gorgeous and funny and smart. And I’m absolutely sure she feels the same way about me. If you wouldn’t almost marry your doctor or choose her as a best friend, why are you going to that doctor? There are sooo many doctors out there, and a huge number of them are seriously excellent at being doctors. Be picky. It’s you’re body. Your body, you understand? Your naked, personal, beloved body. You’re not going to let just any old stranger, especially someone you don’t even like, handle your body, are you? By the way–thanks to the blogger Winegetter, who reminded me to blog about what I’m passionate about. When it comes to someone touching my body, I can get really fired up. Can’t you? Maybe you should. Now, because I want to keep this series uplifting and empowering instead of wallowing in the muck about the horrors of doctors, let’s end on this happy note. My doctor told me yesterday, that my story would be really inspiring to people. (And she was talking about ME, not my memoir, which she doesn’t even know anything about yet). What’s the best compliment, best advice, or best encouragement your doctor has given you? I look forward to following your advice. I agree this is important but although I’ve had a few good specialist, I have not found a good primary care doctor. Good topic Tracy! Thanks for checking in, Gina. Just knowing you’re interested in reading about this helps me focus my thoughts. It is an important subject, but one there is so little truly helpful information about. I think part of the problem is the variabilities of insurance plans, and working within those constraints. But it can be done. We’ve worked it all from both extremes–from having the kind of insurance that paid for any doctor anywhere anytime, to having a severely restricted managed care plan, and we still found a way to get good, consistent care from our provider.